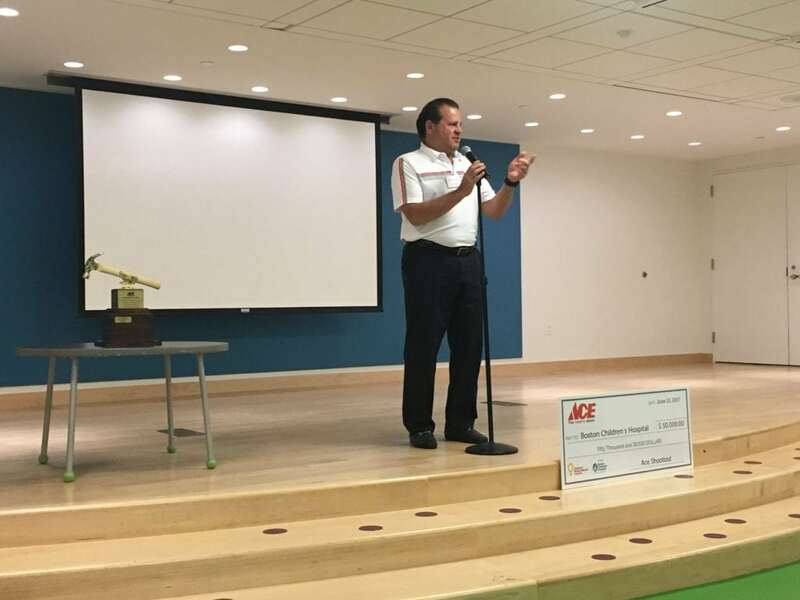 Gold medalist, Mike Eruzione, celebrates $50,000 ACE Shootout gift at Boston Children's – Ace Hardware Corp.
Mike Eruzione, captain of the 1980 U.S. Olympic Hockey Team, was a champion on the ice and is a champion for kids now. Earlier this year, Mike participated in the annual ACE Shootout golf tournament. 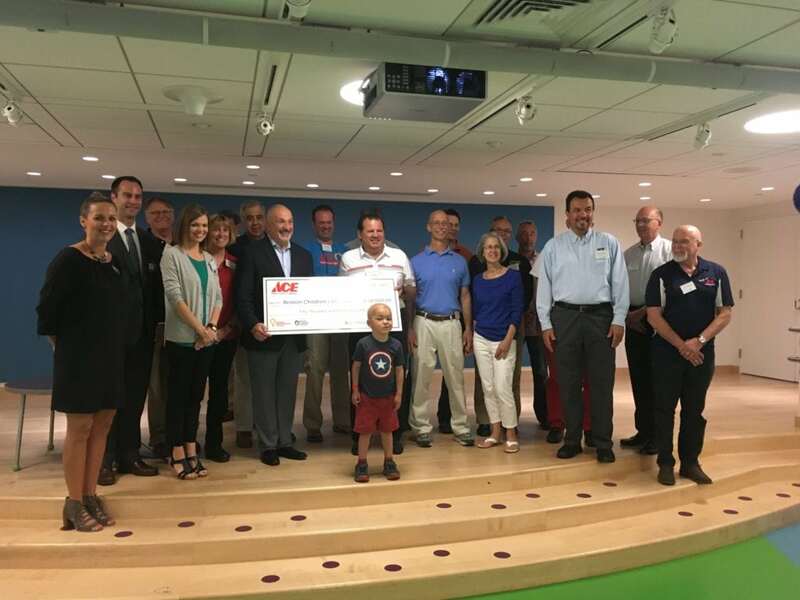 ACE Hardware has been a loyal partner of CMN Hospitals for 25 years and has raised over $70 million. A native of Winthrop, MA, Eruzione played for Boston Children’s Hospitals at the ACE Shootout. He was voted “fan favorite” and took home an additional $50,000. 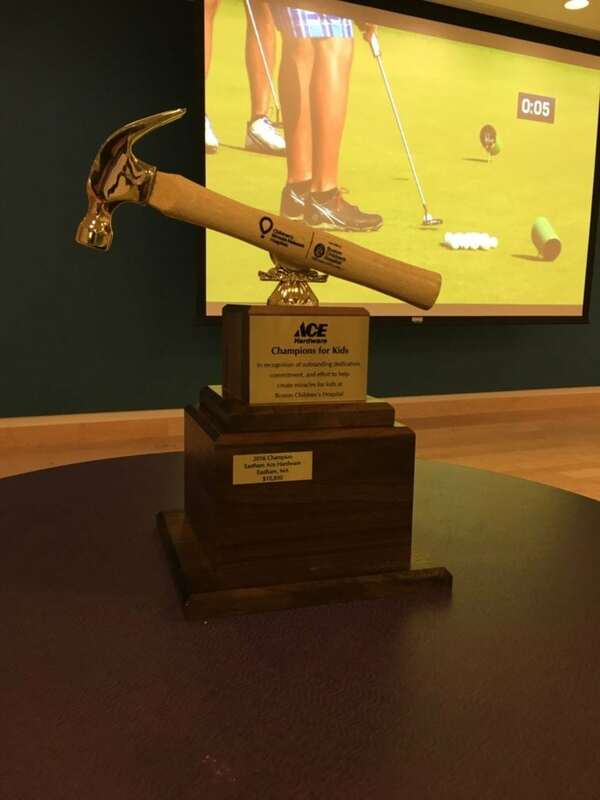 On Monday, ACE retailers, ACE Foundation representatives, and Boston Children’s Hospital staff members gathered to celebrate their collective accomplishments for kids. ACE of Eastham, MA was recognized as the top fundraising location for Boston Children’s Hospital. Darin Krum, store manager of Eastham ACE Hardware, accepted the traveling trophy in recognition of the store raising over $10,000. Krum’s store participates in various fundraising initiatives from Bucket Day to candy sales. Thank you to all the ACE retailers supporting Boston Children’s Hospital, the ACE Foundation, and Mike Eruzione for continued support of Children’s Miracle Network Hospitals. Previous post: $4.1 Million For The Kids!